Trying to practice your golf swings but the weather isn’t cooperating? No worries! The Izzo Golf Tri-Daddy Golf Hitting Net is perfect for both indoor and outdoor use. Our golf net has a unique “pop up” design that makes it easy to set up and take down in seconds! Its unique triangular shape provides an optimal 7’ x 7’ hitting area. The premium mesh netting is engineered and tested to be the strongest in golf. The Izzo Golf Tri-Daddy Golf Hitting Net is so strong that you can use anywhere between a driver through a wedge to swing while using! Practice your swings with the hanging target that sharpens aim while facilitating ball collection. The weight bag included allows net to free stand. This golf net comes with ground stakes for additional support and stability outdoors. Take your Tri-Daddy Golf Net anywhere with the included nylon carry bag, perfect for storage and portability! It easily folds and collapses into a 3.5’ diameter. Size: 6.5' high X 7' wide that you can keep anywhere. Practice all your shots in a variety of lies with the SKLZ Rick Smith Launch Pad all-purpose hitting mat. The mat offers several hitting surfaces: a trio of tees for hitting with oversized drivers, fairway woods, or irons, a fairway surface that simulates the feel of short grass, and a rough surface that mimics the conditions of swinging through a tough lie. 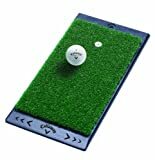 Includes rough surface for practicing a tough lie. As a result, you can practice your drives, iron shots, and short game just about anywhere, provided you have enough room to swing a club. 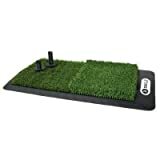 The heavy-duty, non-slip rubber mat measures 1 by 2 feet, with a realistic grass surface that simulates a genuine golf course feel. Comes with Mini Tool Box. Great for storing any miscellaneous items or your spare change. Overall dimensions: 4 1/2" x 2 1/2" x 2 3/4". Mini Tool Box is shipped from a separate warehouse and will arrive within a few days of your order.